The largest plutonium production project in the world occurred at the Hanford Nuclear Reservation, a 560-square mile manufacturing plant located in southeastern Washington. In an effort to beat the Germans (and later the Russians), federal government contractors, staffed with the brightest minds of the day, produced incredible amounts of plutonium with breathtaking speed. Over half of the plutonium used to build the United States arsenal of nuclear weapons, including the plutonium used to build the bomb dropped on Nagasaki, came from Hanford. Most Hanford workers, farmers and others who lived near Hanford from the 1940's through 1960's speak proudly of their community and the vital role they played in America's defense. And rightly so. They are proud of being the "Atomic City," and when Richland obtained its independence from General Electric, one of the federal contractors at Hanford, the town fathers included a mock atomic explosion as part of the celebration. Even the Richland High football team's emblem is the mushroom cloud. What no one knew was that the contractors were knowingly exposing them to radiation. Activities at Hanford resulted in the release of large amounts of radiation into the air, water and soil of the Northwest over several decades. Many of the radiation releases have exceeded permissible limits. Some of the radiation releases have admittedly been intentional, a way of conducting Cold War nuclear experiments on an unknowing and captive population. All of it was done in the name of the national security and the rush to produce more and more plutonium. The largest intentional release of radiation at Hanford occurred in 1949, and is known as the "Green Run." The public was unaware of this event until some 40 years later, in the late 1980's, when the DOE first declassified release reports acknowledging that the Green Run had occurred and then only after a newspaper reporter sued the agency. Documents showed that Hanford intentionally and secretly released about 8,000 curies of radioactive iodine on Dec. 2, 1949. Allegedly the radiation was released to monitor the radioactive plume stretching across Oregon and Washington in hopes of evaluating equipment used in determining the location of similar Soviet plutonium production plants. No one living downwind from Hanford was ever evacuated or warned of the Green Run or any of the other radioactive release from Hanford. Spanning more than 40 years, a set of 400 environmental documents were made public in 1986. These documents revealed that Hanford regularly emitted radiation into the environment. Between 1944 and 1947 the total estimated radioactive iodine released from Hanford was at least 685,000 curies; a truly staggering amount. Despite this fact, contractors working for the federal government at Hanford repeatedly informed the public that Hanford was safe. When the public asked if Hanford was safe, they were told that "not one atom" had ever escaped from Hanford and that Hanford was as "safe as mother's milk." Who are the Hanford Downwinders? Today, citizens of Washington, Oregon and Idaho are outraged that the federal government secretly irradiated them and lied about it. Many are worried about their health, and for good reason. By 1940 standards (much more lax than those of today), the Green Run alone exposed those living near Hanford to amounts of radiation 20 times above tolerance thresholds. Those who lived downwind of Hanford in the years of the releases have subsequently reported widespread incidents of serious diseases often associated with radiation exposure, including cancer and thyroid disease. Although former Secretary of Energy Admiral James D. Watkins admitted that Hanford had released enough radioactive iodine to cause harm to those living around it, the federal government took no action to correct the wrong done to the U.S. citizens downwind of Hanford, the so-called Downwinders. The 241-A tank farm serving the PUREX facility, under construcion in 1954. At least 65 of the 149 single-shell tanks now buried at Hanford have leaked. In light of the fact that the government did not intend to rectify this public wrong without additional pressure, several Downwinders stepped forward in August of 1990 and filed suit in federal court seeking recovery for the injuries they suffered as a result of the releases of radiation from Hanford. This suit later became known as In re Hanford Nuclear Reservation Litigation, and today it has two offspring, In re Hanford and In re Berg. The cases are independent of one another, yet involve injuries caused by radiation exposure from Hanford. Radiation exposure can cause serious health effects, even death. Humans are exposed to radiation in a variety of ways including through air, water and the food chain. According to a formerly classified 1954 technical report, the federal contractors at Hanford discharged at least 8,000 curies of radioactive material per day into the Columbia River. Such radioactive discharges exposed people who ate fish and waterfowl, swam or boated on the river, irrigated their fields with water from the Columbia or simply drank its water. Radioactive discharges from Hanford also reached humans through consumption of foods or plants or the consumption of milk or meat from animals that grazed on contaminated plants or hay. Children, the largest consumers of milk, are more susceptible to the harmful effects of radiation than adults. One of the more horrifying ways in which numerous Downwinders were exposed to Hanford's radioactive materials was through their mother's milk. Like other living organisms, humans who consume contaminated plants or animals, drink radioactive milk or water, inhale radiative material or are otherwise exposed to radiation, also secrete harmful radionuclides into their milk and pass it along to suckling babies in a more concentrated form. As it turns out, Hanford was as safe as mother's milk; but the milk itself was hazardous to the child it was meant to nurture. Hanford's disregard for human health and the welfare of the community around it is shocking. From the immoral and shameful actions of the government contractors silently exposing Americans to radiation to the sloth-like pace of the litigation where tax dollars are used to defend the contractors' actions, the overall picture is mind-boggling. Taken together, it is positively unprecedented. What the government and its contractors did in the name of national security was to declare war on the American public -- the Downwinders. Although a few of the plaintiffs' claims have been decided in pretrial motions, most claims have not yet come to trial eight years after the first complaint was filed. In fact, no trial date has been scheduled and the Downwinders lawyers' investigation into liability has been put on hold. Meanwhile, the only parties that seem to have benefited from the protracted litigation are the federal government contractors and their lawyers. The contractors have made more money in cleaning up the site than was paid to them to manufacture plutonium. And, the federal taxpayers have paid the defense lawyers more than $54.2 million to defend the lawsuit. The Downwinders, the people who bear the scars of Hanford, have received nothing from the federal government. Even when the Downwinders appear to make progress in gaining support from the federal government, it is a struggle to obtain implementation. For example, over a year ago the Agency for Toxic Substances and Disease Registry (ATSDR) ordered the Department of Energy Richland to pay $12.9 million to implement a medical monitoring program and thyroid disease registry of the Hanford Downwinders. ATSDR ordered medical monitoring for people exposed to radiation releases under CERCLA, the Superfund law that governs Hanford's ongoing cleanup. The program is designed to track thyroid disease in approximately 14,000 people exposed as children to radioactive iodine-131. Due to government inaction, on July 2, 1998, one of the Downwinders, Trisha Pritikin, filed a Citizen Suit under CERCLA to compel implementation of the order and payment of the $12.9 million to begin monitoring the health of the Downwinders. Of the 149 massive single-shell tanks buried at Hanford, built in the 1940's and 1950's, at least 65 have leaked. Every year, a new tank is expected to leak. Already, radioactive waste from the tanks has moved through the soil and has reached the groundwater aquifer some 200 feet under the surface. Radioactive contamination in the groundwater could reach the Columbia River in as little as 15 years, threatening salmon runs, drinking water, and irrigated crops. Scientists have yet to develop a pump-and-treat method that can remove the contaminants from the groundwater before they reach the river. Hanford contamination is located at 1,377 sites: 158 containing chemical hazardous waste, 100 containing radioactive waste, 996 containing mixed chemical and radioactive waste, and 123 containing nonhazardous waste. It has been estimated that at least 1.2 million cubic yards, enough to cover a football field 700 feet deep, contain radioactive contaminants. Hanford's funding for clean-up during the current fiscal year is approximately $1.1 billion. Estimates project the total clean-up cost could ultimately reach $50 billion. The clean-up of Hanford is governed by the 1989 Tri-Party Agreement between the Environmental Protection Agency (EPA), the U.S. Department of Energy (DOE), and the Washington state Department of Ecology (Ecology). The agreement was executed in anticipation of the listing of four sites at Hanford on the National Priority List under the Superfund Act. The agreement is the legal document that binds the DOE to actions which comply with the Resource Conservation and Recovery Act (RCRA), CERCLA and the state Hazardous Waste Management Act (HWMA). The agreement contains "definitive work schedules" with major milestones which are enforceable commitments for the most significant actions in the action plan. Unfortunately, the work schedule and major milestones have frequently been treated as rough targets rather than enforceable deadlines. The state of Washington has recently become more active in taking issue with the federal government and its contractors at Hanford. In early June, Governor Gary Locke and State Attorney General Christine Gregoire announced they would file suit in 60 days to force the DOE to comply with its agreement to meet a year-2000 deadline for draining leaky radioactive waste tanks located seven miles from the Columbia River. Fluor Daniel Hanford Co., the company that presently manages clean-up projects at Hanford, earned only 55 percent of its performance-based contract during its first year on the job. The fee was reduced for failure to meet objectives related to designing and construction, site planning and integration, environment, safety and health, and financial management. The state of Washington and the EPA have also criticized Fluor Daniel for cost overruns and delays in completing the K Basins project. The K Basins are two indoor pools that are holding ponds for 2,300 tons of spent nuclear fuel. Their clean-up is considered a top priority in Hanford, yet the clean-up deadline has been shifted several times. The current schedule calls for completion by 2003, but a recently proposed revision would place the completion date sometime between 2003 and 2006. The two holding ponds, located a quarter of a mile from the Columbia River, hold 90,000 highly radioactive, used fuel rods left over from plutonium production at Hanford. The basins contain more than 80 percent of the nation's spent nuclear fuel. A tiny amount of plutonium has been found in an aquifer just north of the K Basins, only a few hundred feet from the Columbia. It is unclear whether the plutonium resulted from a past leak at the K East Basin, from Hanford's production days when waste water was poured into the ground, or from a new leak in the basins. It is clear, however, that cracks in the fuel rods are allowing the plutonium to escape into the pond water, placing the workers there at risk. But threats to worker safety pose a huge risk anywhere on the Hanford reservation. On May 14, 1997, an explosion rocked the Plutonium Finishing Plant (PFP) in Hanford's 200-West Area. According to the DOE, the explosion was caused by the mismanagement of dangerous concentrations of chemicals left in a 400-gallon stainless steel tank following a worker-training exercise in 1993. Nine construction workers who were present at the time of the explosion were ordered to walk into the path of the toxic chemical release, then held on site for four hours without medical attention. When they were finally released, they had to drive themselves to the emergency room. 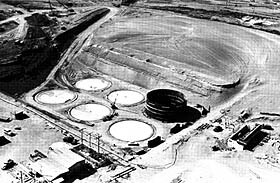 On April 9, 1998, tests confirmed that two other Fluor Daniel Hanford employees inhaled plutonium while working on equipment at the PFP. The workers were not wearing respirators because the procedures for the task did not require them. A Fluor Daniel spokesman admitted that Fluor Daniel had "misdiagnosed the hazard" in planning the task. This was not the first mishap with plutonium handling during Fluor Daniel's tenure at Hanford. In late March of 1998, DOE announced that it planned to impose one of the largest fines in the history of its nuclear safety program against Fluor Daniel, $140,625, for safety violations associated with the handling of plutonium between November 1996 and June 1997, and with the May explosion at the PFP. This was the second fine to address the explosion at the PFP. Ecology fined DOE, Fluor Daniel and a subcontractor $110,000 for errors leading to the explosion and for poor emergency response. Despite these persistent problems with the contractor charged with management of the Hanford site, other Hanford contractors have shown some progress. On July 14, 1998 the DOE, citing "consistently excellent" performance, announced it was extending for three years the contract of the contractor charged with environmental restoration, Bechtel Hanford. Bechtel's environmental restoration contract covers managing a huge contaminated debris landfill, removing contaminated soils, operating facilities to pump and treat contaminated groundwater, and decontaminating and sealing off old reactor complexes. During fiscal year 1997, nearly 500,000 tons of contaminated soil were removed from the three Hanford sites bordering the Columbia River. Unfortunately, Bechtel's successful work is but a small part of the overall clean-up process. Bechtel's share of the funding represents only 12 percent of the total annual $1.1 billion clean-up budget ($132 million). Bechtel's new contract will be 100 percent performance-based. Time will tell whether Bechtel fares better than Fluor Daniel under the new system. It is anyone's guess when the Downwinders will be compensated for the injury, both physical and psychological, they have borne through the years as a result of the Hanford's releases. It is also unclear when the clean-up of Hanford will be completed, and whether damage to the environment can be completely remedied. Despite its public commitment to Hanford clean-up, the DOE is evidently not willing to mothball Hanford just yet. An ongoing debate rages over the possibility of restarting weapons production at Hanford's Fast Flux Test facility (FFTF), which was shut down in 1993. Re-starting the FFTF would result in the importing of as much as 33 tons of plutonium and the production of 60 tons of waste during 30 years of operation. In its present "hot standby" status, the reactor is taking $32 million a year from the clean-up budget. Many critics of the FFTF, including Oregon Senator Ron Wyden, question this diversion of funds. In addition, Hanford is one of four candidate sites presently being analyzed by the DOE for the treatment of more than 50 tons of surplus plutonium. The final environmental impact statement and record of decision on this matter are expected to be issued in early 1999. What is certain is that the government's failure to act responsibly toward its citizenry and the environment has created a complex problem that requires concerted attention. It is long past the time for the government and its contractors to accept responsibility for their past misdeeds. Action is needed and constructive steps must be taken to detect illnesses to the affected population before more people suffer. Action is likewise needed to preserve the stability of the Columbia River ecosystem. To be successful, it will take cooperation and the resources to do the job correctly. Human health continues to deteriorate, diseases go undetected, and our precious resources continue to be wasted as long as the government continues to deny its responsibility. Our government leaders should be better examples than that and the Downwinders and our natural environment deserve better. It is time that this undeclared war on the American public come to an end -- that the victims of the war be made whole and that the healing begin. Richard A. Du Bey is chairman of the Environmental and Natural Resources Practice Group for Seattle law firm Short Cressman & Burgess P.L.L.C. Connie Sue Martin and R. Brent Walton are associates with the firm's Environmental and Natural Resources Practice Group, and members of the firm's Hanford litigation team.